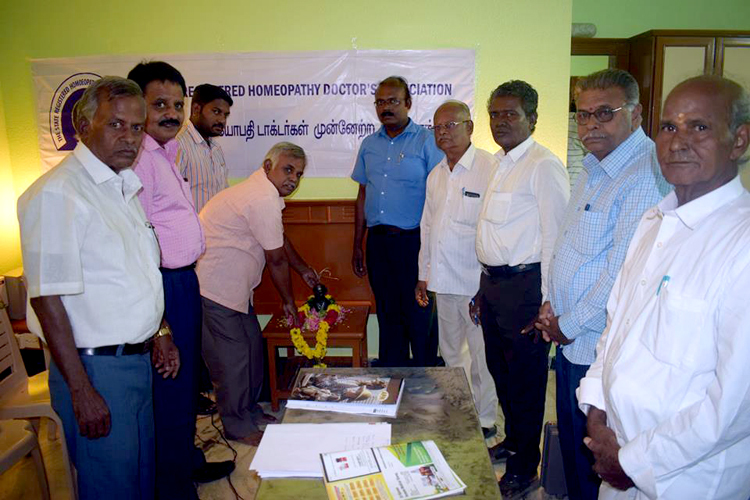 KUMBAKONAM.AUG.27: The Tamil Nadu Registered homoeopathy Doctors association (TSRHDA) hosted a CME with Dr.R.Gnanasambandam, former president, Tamil Nadu Homoeopathy Medical Council on Expertise in Chronic Disease. Dr.S.Sampathkumar, President welcomed the gathering. Dr.Sivagnanam,Former AMO Chief Guest Garlanded Hahnemann’s bust. Dr.Mukilan, President TN IHML, Tanjore, Dr.K.Elamaran, District Secretary, IHML delivered keynote address.